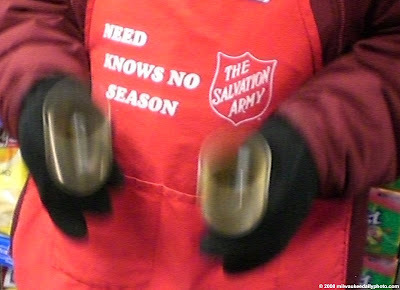 The Salvation Army is always in need of donations... as the apron says, "Need Knows No Season". Yes times are hard for many of us. For some, it's not nearly as bad as it is for others. Drop a coin or a bill in the little red bucket, and help someone out. It's just that easy. what a cool picture... great "action" shot!